Now a day it is very easy to establish communication from one part of the world to other. Despite this even now in remote areas villagers travel to talk to family members or to get forms which citizens in-developed countries an call up on a computer in a matter of seconds. The government tries to give telephone connection in very village in the mistaken belief that ordinary telephone is the cheapest way to provide connectivity. But the recent advancements in wireless technology make running a copper wire to an analog telephone much more expensive than the broadband wireless Internet connectivity. Daknet, an ad hoc network uses wireless technology to provide digital connectivity. Daknet takes advantages of the existing transportation and communication infrastructure to provide digital connectivity. Daknet whose name derives from the Hindi word "Dak" for postal combines a physical means of transportation with wireless data transfer to extend the internet connectivity that a uplink, a cyber cafe or post office provides. Daknet offers data to be transmitted over short point-to-point links. It combines physical and wireless data transport to enable high-bandwidth intranet and internet connectivity among kiosks (public computers) and between kiosks and hubs (places with reliable Internet connection). Data is transported by means of a mobile access point, which automatically and wirelessly collects and delivers data from/to each kiosk on the network. 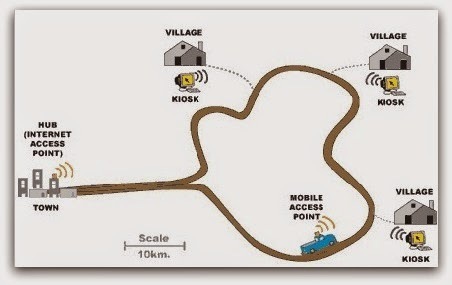 Low cost WIFI radio transceivers automatically transfer the data stored in the MAP at high bandwidth for each point- to- point connection. Since it avoids using phone lines or expensive equipment, Daknet provides one of the lowest-cost accessibility solutions in the world. In addition to low cost the other feature of Daknet is its ability for upgrading the always-on broadband connectivity. As the village increases its economic means the villagers can use the same hardware, software and user interface to enjoy real-time information access. The only change is the addition of fixed location wireless antennas and towers, a change that is entirely transparent to end users, because they need not learn new skills or buy new hardware and software. Daknet's low deployment cost and enthusiastic reception by rural users has motivated dozens of inquiries for further deployments.